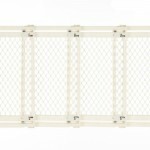 The North States Supergate Clear Choice Gate is unique with it’s see through plastic panels. The sturdy hardwood frame surrounds the panels which adjusts to fit openings 26 to 42 inches wide and is 23 inches high. 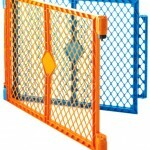 The gate easily pressure mounts in seconds without the use of hardware. 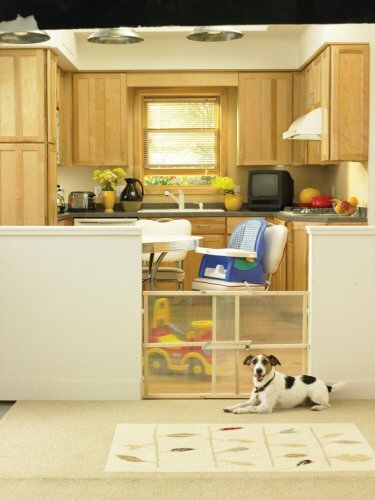 The extra-strong panels are designed to prevent children or pets from climbing over. It’s the perfect solution for the bottom of stairs or between rooms. The rubber bumpers on either side of the hardwood frame keep the gate in place without marking walls. 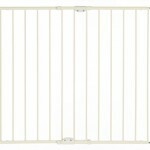 This gate is proudly made in the U.S.A.
Q:Could a ferret or kitten climb the mesh and get over?? or is it a solid piece in the center? It’s a solid piece. Like plexie glass. No mesh. My two ferrets have yet to climb it- it’s too high for them.. However, my kitten eventually figured out how to jump over it.. But that’s to be expected with a growing kitten. 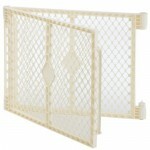 I would def recommend this gate, especially for ferrets! Hope this helps.